Christmas Karaoke. | Nicki Kinickie Nicki Kinickie: Christmas Karaoke. On Saturday night we headed over to some extended family members for a little do in their back garden bar. Patricks mum and her husband were back from Holland for a flying visit to see his side of the family so as we were free we thought we would pop over and see them too. Despite having a headcold and annoyingly tickly throat with one of those wafty coughs that doesn't relieve the irritation at all, I couldn't resist the urge to have a sing song on karaoke especially as I could sing CHRISTMAS SONGS!! Renditions of Band Aid, Wizzard and many more were sung throughout the evening and I was sounding more Marge Simpson than Jessica Simpson but it was all in the name of good fun! On Sunday (in the wake of our singing shenanigans) my husband asked me what my favourite Christmas song was - a question I thought I could easily answer but it turns out I can't! There are just too many songs that I love I couldn't choose just one! I am that sad and love Christmas that much that I even enjoy hearing festive songs that I am not so keen on JUST because of the time of year. Wizzard - I wish it could be Christmas every day. They are my absolute, 100% favourites but in all honesty I love so many more.... Mike Oldfield, Frankie goes to Hollywood, Shakin Stevens, East 17 (although I never understoof why that stuck as a Christmas song?!) ....the list is endless! It does make me wonder if these songs will still be played in 100 years time just like they are now or if they will have become too old fashioned. Maybe no one will be as interested in playing songs that were recorded long before they (or indeed their parents) were born? I like to think that they are so classic and catchy and are a tradition to everyone young and old that they will never stop being played at this time of year! I heard on the radio this morning that apparantly 'Fairytale of New York' is the most played Christmas song of the year (although I am guessing that it isn't really played in the height of summer!). I can understand why.... it is so catchy and timeless! The lyrics are beautiful too. 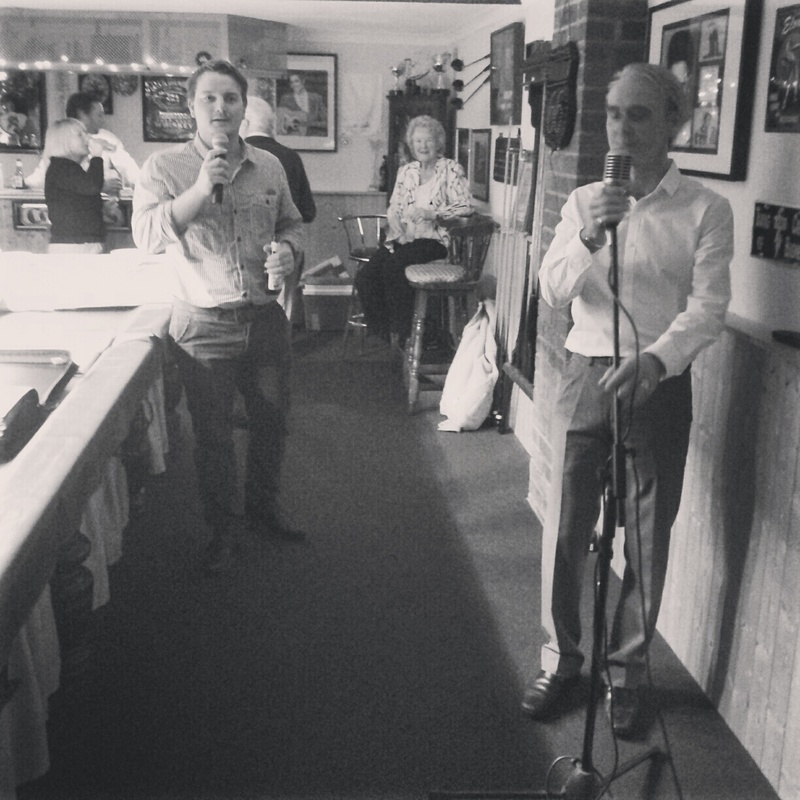 SING SONG: My hubby and his mum's hubby take to the mic!